Sorry this is a little late. It has been a crazy few weeks, but I wanted to still get this posted. I received some awesome products for April! Total Value before Makeup Bag with bonus: $66.06! Initial Thoughts: I LOVE Ipsy! They sent me a full size of two of my absolute favorite brands (Zoya and Urban Decay)! You could seriously just send me an Urban Decay Eyeshadow every month and you will be my favorite subscription box. Best Bonus EVER! I have also been loving Macadamia Oil recently. This brand was actually the first hair oil I added to my Amazon wish list and I never did purchase it. I love it! The only product that I was not thrilled about was the yaby concealer and after using it; I actually like it too. I'm not a fan of wearing vanilla scents, but I am kind of digging the Pacifica roll-on. The Juice Beauty gloss is awesome and my favorite Juice Beauty product I have tried so far. This was pretty much the perfect sample bag for me. 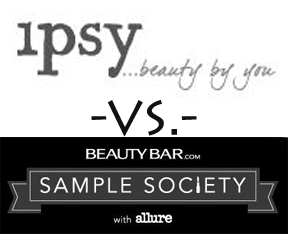 Great job Ipsy! *Initial Thoughts: Thrilled about the Dr. Brandt BB Cream and the Alterna Bamboo Mist. I am in LOVE with the Alterna spray. I have used almost the whole bottle already. I have also priced it on Amazon (it's cheaper!) and added it to my wish list. The Dr. Brandt BB Cream is nice too. I am not sure yet if I like it more than my Smashbox, but I do like it a lot. I was a little disappointed with the size of the Jane Iredale Stain. I have used the sample quite a bit though. The Yu-Be is one of the most disgusting worst products I have ever tried. It smells like the worst medicated menthol cream ever...and it isn't really a cream. It is more of a nasty, thick ointment. I tried to rub some on my hands when I first got it and I swear it took days to get rid of that feeling and smell. Gross. I have a dilemma with the Kate Somerville Tanning Towelettes. I really, really want to try them...BUT...I am uber pale and turn orange with self tanning products sometimes. I have one towelette. I want to save it for something special but at the same time I want to use it on a day where I am not doing anything in case I need to hide my orangeness. What to do? 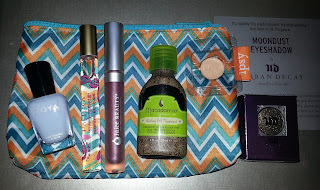 *This Month's Winner: Hands down Ipsy! It had a much higher value and I loved everything. 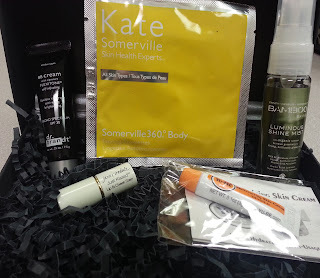 I liked my Sample Society box as well and it actually contained my favorite product of the month (the Alterna spray), but I LOVED my Ipsy bag. It was a great month for subscription boxes! i ditched birchbox for ipsy last week. hoping my first bag is amazing! i can't believe you got UD in yours!! I didn't love my Ipsy bag as much as you liked yours. I didn't get the Pacifica perfume or the UD eyeshadow, both of which I would have loved. Instead I got orange lipstick and bronzing lotion, which really aren't my thing. I think Ipsy is my favorite beauty sub, even though this wasn't the best month for me. This was another delightful bag for me! I love Zoya so the full size nail polish was wonderful. The Pacifica Coconut/Pearl lotion was utterly decadent and my favorite thing. The Pacifica Tahitian Gardenia roll-on perfume was another favorite item as the smell is exotic and stays with you for many hours. The Juice Beauty lip gloss tastes good and gave a nice hint of color which was yet another top item. Looking forward to next month as these last two months have been really good!